Crack cocaine, also known as rock, work, hard, iron, cavvy or base first showed up on the scene in impoverished areas of Los Angeles, New York and Miami in late 1984 and 1985. Crack cocaine is a highly addictive stimulant drug sold on the streets. The drug earned its name from the crackling sound emitted from heating the crystal rock. Cocaine is a derivative of Erythroxylon cocoa. To date, there is no FDA-approved medical drug that can be prescribed to treat this dangerous addiction. 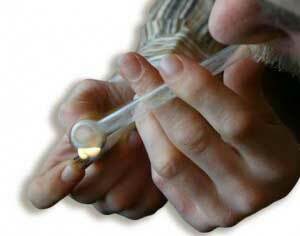 Crack cocaine addicts attest to crack cocaine’s intense euphoric effects as the reason for their addiction. Crack Cocaine was popularly thought to be the most addictive form of cocaine, but that idea has been challenged in recent years. Because Crack is an illicit drug, users may consume impure or fake batches of the drug which can cause serious health-related problems above and beyond those encountered from the “normal” batch. A Crack Cocaine Intervention is often the favored route for getting a loved one into therapy to stop the dangerous cycle of addiction. A Crack Cocaine Intervention is performed by one of our highly trained Interventionists who is familiar with the intricacies of crack addiction. Providing the family with effective tools and a working plan, we not only strive to help the addict get the proper treatment and recovery, but to also help the family of the addict to take their individual and collective life back from the throes of addiction. There are definite, recognizable symptoms visible to people close to an addict that include dilated pupils, breathing difficulty, irritability, sexual dysfunction, paranoia, extreme weight loss, insomnia, financial problems, depression and inability to keep a job. Crack cocaine addiction intervention is an important step available for the prevention of the life-threatening and devastating impact on an addict’s health that is less visible but much more dangerous. Crack cocaine use can cause heart attacks, seizures, stroke, respiratory failure, endocarditis, lung collapse, infertility, convulsions, coma, and sudden death. Considering the possibility of harm or death, family members and friends are advised to seek help if they notice the symptoms above associated with a loved one. Crack cocaine addiction intervention offers a viable approach to reaching out to a loved one and expressing concern for their well-being. Given the power of crack cocaine and the unparalleled rush associated with the drug, it is critical to intervene as soon as possible before something terrible happens. The first step to take when planning a crack cocaine intervention is to hire a professional interventionist who has experience. This professional can provide the necessary guidance required for the best possible results. People important to the addict such as family members and friends are asked to participate in the intervention. Before the actual intervention, a meeting is typically held with all participants. The professional interventionist uses this forum as a coaching opportunity to explain the intervention procedure. Participants rehearse what they want to say to the addict. Participants are reminded about the goal for the intervention. The objective of the intervention is to get the addict to immediately go into a treatment program. Participants are supposed to express their concern for the addict’s well being. While interventions are not always successful, interventions are often the answer. Many addicts admit that they went into treatment as a direct result of an intervention. The Intervention leads to treatment where the addict will undergo detox and spend several days dealing with issues they have been avoiding by using their drug of choice. Staying sober is not enough at the beginning. There needs to be a recovery plan in place to help your loved one re-learn how to live their life free of substances and the psychological and emotional damage caused by addiction. When we use, or more concisely, abuse substances, we stop growing as individuals. The use of the substance replaces normal coping mechanisms, stunting the emotional maturity level of the user. It is important to learn how to live life and cope with issues as they arise rather than to run to our substance of choice. Intervention Services USA has been providing Crack Cocaine Interventions for over 10 years. Contact our Intervention Coordinators to speak about your loved one’s addiction and how we can help end the roller-coaster.